Capacitors block DC whilst allowing AC through. If there is noise present on a DC voltage, a capacitor can link the circuit directly to ground. 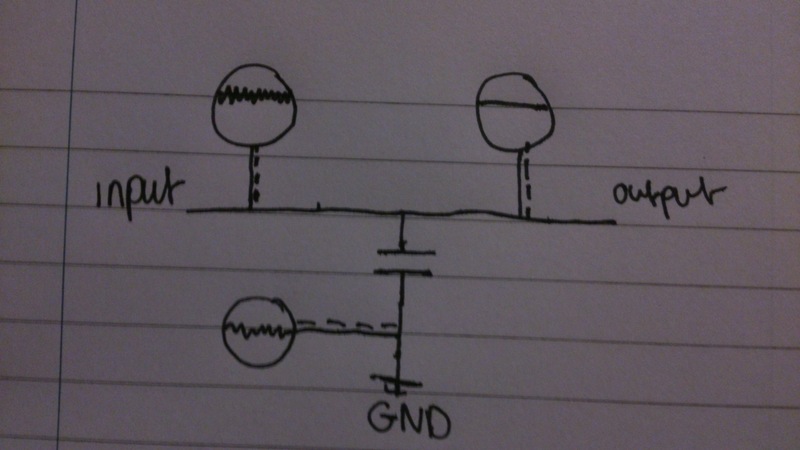 The effect of this is that any noise (as AC) will filter down through the capacitor to ground, whilst DC will pass though the rest of the circuit as though the capacitor wasn’t there. When used in this way it is known as a decoupling capacitor. This entry was posted in Capacitors, electronics and tagged Basics, capacitors, Coupling, coupling capacitors, Electronics, noise, noise cancellation, thelectronics. Bookmark the permalink.